If you'd like to get someone's attention in an email message or a meeting invite, you can type the @ symbol, followed by their name, in the body of the email message or a meeting invite. 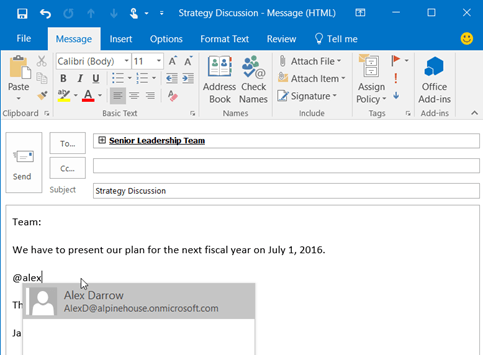 If you do this, not only will their name be highlighted in the message body or invite details, but Outlook will automatically add them to the To line of the email or meeting invite, and they'll see the @ symbol next to the message in their Inbox. When Outlook offers you one or more suggestions, choose the contact you want to mention. By default, the contact's full name is included. You can delete a portion of the mention, for example, everything other than the person's first name. The mentioned contact is also added to the To line of the email or the meeting invite. If you receive a lot of email, you might want to filter the messages in a folder to see only those messages that mention you. Above the message list, choose All. On the Home tab, choose Filter Email. 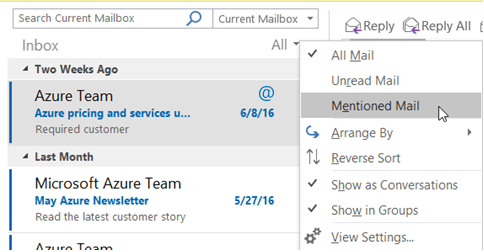 Note The Mentioned mail feature and the @ (at symbol) indicator are only available for recipients using Exchange Server 2016, Exchange Server 2019, Exchange Online, or Outlook.com.